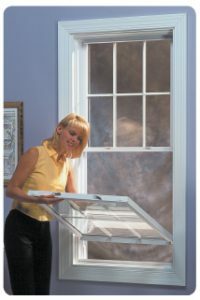 Sliding windows, also known as gliding windows, slider windows or pocket sliders operate horizontally with one sash sliding in a pocket past the other to provide ventilation. Many modern and ranch style homes are designed using the slider window style. The sashes may be lifted out of the pocket for cleaning without a ladder. A casement window also referred to as a crank-out window has a single sash that opens outward on a vertical axis by rotating a crank that is attached to the sash with heavy duty hinges. 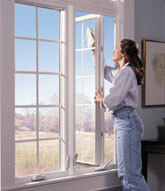 The hinges can open the sash to a full 90 degrees allowing for easy cleaning from inside the home. A multipoint locking system closes the unit tightly from a single lever. Casements may be joined together into double, triple or quadruple units. A garden window projects out from the wall of the house. It has four window units. The two ventilating side units are trapezoidal casement units that open outwards with a crank. The center unit and the roof are picture windows. The insulated glazed roof is designed to to be weather tight and leak proof. 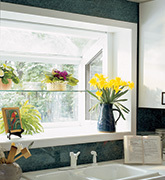 It’s called a garden window because it provides an ideal environment for growing plants indoors.